We believe there are many paths to Jesus Christ. We believe we are all on a journey to discover where God is leading us. We believe in the individual’s capacity for finding Truth. We believe in growing together. We believe that Christ has risen, and that He will one day come again. Your interpretations and perspectives might very well differ from those held by others at First Federated Church. But ours is a church of tolerance and understanding. Thus you will not be told what to believe nor how to act. We will instead seek God through Christ’s teachings, as they are accessible to all and welcome individual interpretation and reflection. Our logo represents all that we are. We begin with a circle, a long-standing symbol of completeness and wholeness. At FFC, we minister to the whole person and to the whole world. The circle is divided into four smaller circles. These circles remind us of our diverse nature – that God created us as physical, spiritual, intellectual, and social beings. At FFC, we touch every aspect of Life. Stemming from the center of our logo are four fleurs-de-lis, each a traditional symbol for the Trinity – Father, Son, and Holy Spirit. Each fleur-de-lis is shaped like a cross. Together the four fleurs-de-lis form a large cross. Running diagonally through the logo there is a more contemporary cross. These crosses remind us that at First Federated Church we are rooted in Christian tradition while we are embracing the future as we serve Christ today. We also remember that God reaches out to us before we can reach out to God. In response, we are called to reach out to each other and to the greater world as we seek to Glorify God. At FFC, we look ahead without forgetting our faith. Both crosses – the modern and the traditional – share a common center, just as our lives share a common center: the life, love, and teachings of Jesus Christ. At FFC, we are students and followers of Jesus Christ. Our proud history began in the early 1830s when Congregationalists and Presbyterians arrived to Peoria, then a frontier village on the rise, where they first worshipped in a simple log cabin. First Congregational was organized in 1834; Second Presbyterian was organized in 1853. They built their congregations and houses of worship, established Sunday Schools, engaged in mission work at home and abroad, provided leadership within their churches and community, and occupied influential positions in the religious life of Peoria. The First Congregational Church building at Hamilton and Monroe was destroyed by fire in March of 1936, a local tragedy that soon prompted Second Presbyterian to invite this newly homeless congregation to worship with them in May of 1937. 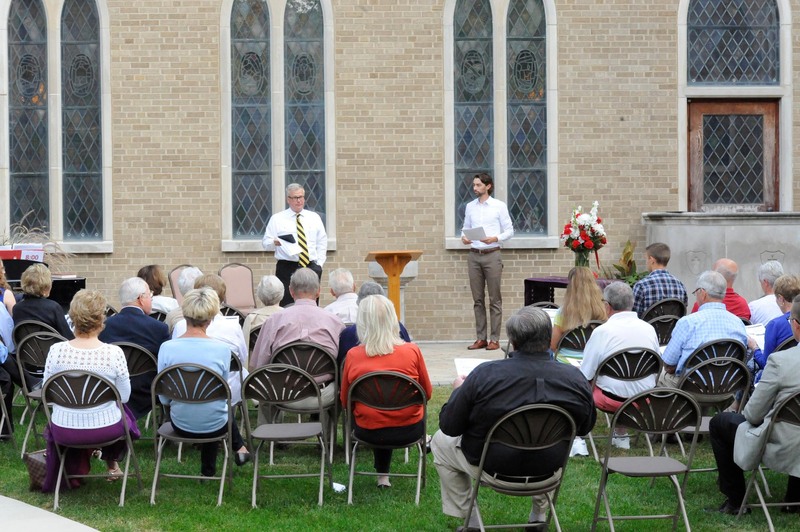 Both congregations had limited resources and desired to continue a program of Christian service and leadership. Along the way they discussed plans to unite through a federation agreement which they finalized with the ratification of the Articles of Federation in November of 1937. The name adopted was FIRST FEDERATED CHURCH. A new church building was part of First Federated’s plan. The congregation worshipped in the Second Presbyterian Church building at Madison and Jackson (now Peoria’s Cornerstone Building) until a new building was constructed on Florence Avenue at Sheridan Road. The church building was dedicated in January of 1950. Today’s congregation continues the legacy of Christian service and leadership in the religious life of Peoria.